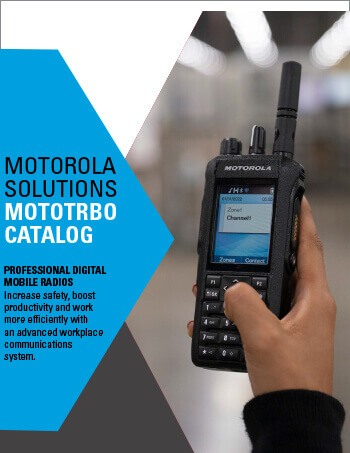 MOTOTRBO is the first digital two-way radio system from Motorola specifically designed to meet the requirements of organizations/industries outside the public safety sector mainstream that require a customizable business-critical communication solution using licensed radio spectrum. MOTOTRBO is a complete two-way radio system that includes portable and mobile radios, a repeater, accessories as well as powerful data applications, such as Text Messaging Services and Location Services. Is MOTOTRBO a series of radios, or simply a single model of radio? MOTOTRBO provides a complete dual mode (analog and digital) system including repeater, mobile and portable units, data applications, and accessories making it easy and affordable for large organizations/businesses to customize a MOTOTRBO solution to meet specific needs and migrate to digital at their own pace. MOTOTRBO combines exceptional two-way radio functionality with digital technology to deliver increased capability and spectral efficiency, integrated data applications and enhanced voice communications. In the ongoing effort to improve workforce productivity and operational effectiveness, organizations need to communicate with and provide information to employees anywhere on 24/7 basis-easily and cost effectively. This is especially important for organizations or enterprises whose workers are mobile—moving about a geographic area to accomplish their jobs. Analog two-way radio technology is an effective, proven technology. Why switch to digital? Offering advantages such as a lower total cost of ownership, customizable coverage and features, and a simple and reliable implementation makes analog two-way radios the clear choice for the vast majority of large organizations/enterprises with highly mobile workforces. However, this technology has reached the limits of its innovative life. Analog two-way radio has limited battery life, degrading voice quality near at the edge of coverage, and lacks integrated data applications. Additionally, as analog radio users reach their licensed spectrum capacity, crowding the interference occurs. These users can easily justify migrating to the digital technology of MOTOTRBO because they need clear, unbroken, reliable communications. A missed call, user error, garbled message or a dead battery can mean lowered productivity, wasted time and money, unsatisfied customers, interruptions to essential services, or lost business. It's been said that MOTOTRBO pricing is "comparable" to similar analog solutions. What does that mean? Motorola made an investment in the MOTOTRBO technology platform in order to bring integrated applications and advanced functionality to the large organization/enterprise two-way radio market. MOTOTRBO was developed to be offered at a competitive price-point compared to existing analog two-way radio solutions. As a result, we believe that MOTOTRBO provides such increased functionality and operational efficiency that end-users will want to move to digital platforms faster. What standard is MOTOTRBO based on? MOTOTRBO is designed to the globally-recognized European Telecommunications Standards Institute (ETSI) Digital Mobile Radio (DMR-Digital Mobile Radio) tier two standard for large organization/enterprise mobile radio. This provides an open platform that enables market acceptance and multi-vendor interoperability for voice and IP data and will assure competitive pricing while protecting customer investment. Why TDMA and how does TDMA differ from FDMA? Frequency-Division Multiple-Access (FDMA) splits the channel frequency itself into two smaller sub-channels that can carry separate calls side-by-side. By comparison, Time-Division Multiple-Access (TDMA) preserves the full channel width, but divides it into alternating time slots that can each carry an individual call. Motorola maintains that two-slot 12.5 kHz TDMA-based systems, providing 6.25 kHz equivalency, are the better choice for most large organization/enterprise radio users. Wireless standards based on TDMA technology are already widely used around the world, and future requirements for even greater spectral efficiency also are expected to be based on TDMA. TDMA technology for narrowband 12.5 KHz (6.25 equivalent-6.25e) organization/business radio users, provides advantages of feature flexibility, lower equipment costs, longer battery life, future-readiness, and the proven ability to increase spectral efficiency without risking increased congestion or interference. Doesn't Motorola offer FDMA-based systems in addition to TDMA? Motorola does offer FDMA-standards based two-way radio systems for large public safety and government communications networks that require dedicated channels. Is MOTOTRBO compatible with P25 technology/systems? No. The P25 protocol (TIA Project 25 standard) was adopted for public safety sector use and currently uses 12.5 KHz FDMA technology. MOTOTRBO supports the ETSI Digital Mobile Radio (DMR) standard for large organization/enterprise two-way radio customers and uses 12.5 KHz (6.25 equivalent-6.25e) TDMA technology. How much and what type of industry research was put into developing this system? Motorola spent a significant amount of time developing MOTOTRBO, working with customers, distribution channels and the various businesses/organizations to research respective communications requirements. The research revealed that the various organizations/enterprises want or require spectral efficiency, better basic as well as enhanced features, integrated applications to improve operational efficiency, and a comfortable migration path from analog to digital. Does the arrival of MOTOTRBO mean the end of analog system development and product offerings from Motorola? No. Motorola offers an expansive portfolio of two-way communications solutions for a variety of customer segments. We are committed to providing the right technology to address specific customer needs and uses. Motorola will provide analog solutions as long as there are business segments that benefit from them and as long as market drivers and regulatory requirements permit. What types of organizations/businesses would be best suited for MOTOTRBO? Public (government) administration, public works, manufacturing facilities, transportation companies, small campuses such as resorts and schools, construction sites,and energy/utility companies, as well as small, municipal public safety organizations. What is meant by MOTOTRBO's increased capacity and spectral efficiency? MOTOTRBO delivers improved spectrum efficiency compared to analog radios and alternative digital offerings, by doubling channel capacity, supporting more users, and enabling more information to be transmitted on existing frequencies. MOTOTRBO's spectrum efficiency doubles the number of users large organizations/businesses can support on a single licensed 12.5 kHz channel. Digital two-way radio solutions based on Time-Division Multiple-Access (TDMA) technology enable two virtual channels within a single 12.5 kHz licensed repeater channel. This provides twice the calling capacity for the price of one license and enables more information to be transmitted on existing frequencies. And because there's only one "real channel", a second call doesn't require a second repeater. What is the lifespan for a MOTOTRBO system? Due to its functionality and platform design, we anticipate that MOTOTRBO will meet the average lifespan for existing large organization/enterprise two-way radio systems, which is approximately five to seven years. Can MOTOTRBO accommodate advanced applications? Yes. Take, for example, MOTOTRBO Location Services. MOTOTRBO's GPS location tracking provides the ability to track people and assets, such as vehicles. This advanced approach uses a GPS client and receiver integrated within both the portable and mobile radios, plus MOTOTRBO Location Services computer software. The GPS-equipped portable and mobile units can be configured to transmit their geographical coordinates at pre-programmed intervals on demand and in an emergency. The MOTOTRBO Location Servicescomputer software provides dispatchers with real-time display of fleet activity on a high resolution, colorcoded map. Do MOTOTRBO's advanced applications include text messaging? Yes. MOTOTRBO's advanced applications include rapid unit-to-unit and unit-to-group text messaging between radios, between radios and dispatch systems, between radios and IP addressable devices, and to remote PC clients attached to radios. When used on their own, MOTOTRBO portable and mobile units also support built-in capabilities for free-form and canned text messaging between radio users and talk groups. The MOTOTRBO computer software application adds a PC-based, client/server software application for dispatch-oriented messaging to the system, which extends the capabilities of messaging to include communications between radios and dispatcher PCs. Further, the dispatcher PC can act as a gateway to email, enabling messaging between email-addressable devices and radios. Where does MOTOTRBO fit in Motorola's portfolio of products? MOTOTRBO broadens Motorola's history of delivering communication innovations that leverage standardsbased technology to better serve our customers. Motorola has been a leader in digital two-way radio communications for more than two decades, including launches of ASTRO® 25 (compliant to TIA Project 25 standard) and Dimetra IP (compliant to ETSI TETRA standard), the industry's first mission-critical digital two-way radio systems for large public safety organizations. Motorola's first P25 system was launched in 1996. In 2005, Motorola launched the DTR Series of on-site digital two-way radios for retail businesses to address their requirements communications that enhance productivity, but in some countries do not require licensed spectrum. Does MOTOTRBO replace any current Motorola models? No. MOTOTRBO does not replace any of our current offerings. Instead, the system augments Motorola's current digital portfolio: With the introduction of MOTOTRBO for the organizations/enterprises already identified, Motorola now has one of the industry's most comprehensive portfolios of digital radio solutions.